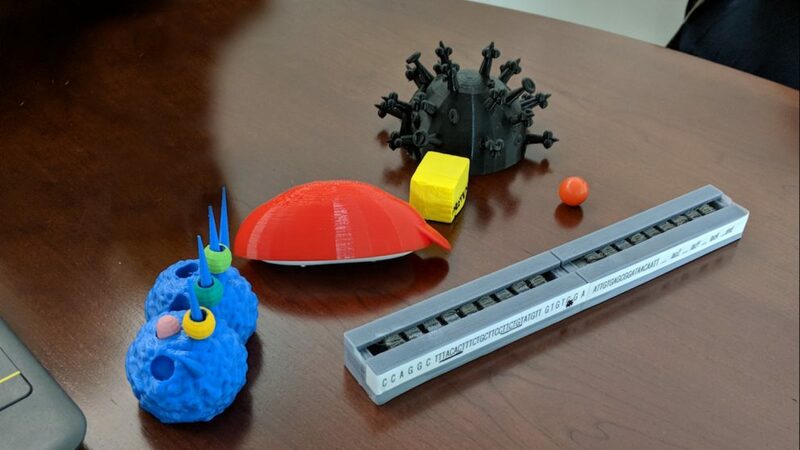 Various models of biomolecules 3-D printed in the D.H. Hill Library Makerspace. Teaching Assistant Professors Claire Gordy and Melissa Ramirez began working with DELTA in Fall 2017 to build a website where educators at NC State and beyond can share 3-D printable designs to enhance student learning in biological science courses. The DELTA project team includes Multimedia Specialist David Tredwell, Multimedia Web Specialist Jennafer Pettit and Instructional Designer Rebecca Sanchez. DELTA Learning Analytics and Assessment Coordinator Chris Willis also worked with the team in the beginning stages of the project. This collaboration is part of an exploratory DELTA grant project, titled Integrating Tactile Teaching Tools to Enhance Inclusivity in Science Learning. Gordy and Ramirez wanted to find a way to make science courses more accessible to students with learning differences and visual impairments. “We realized that maybe these 3-D printed models are part of the answer to that problem,” said Gordy. 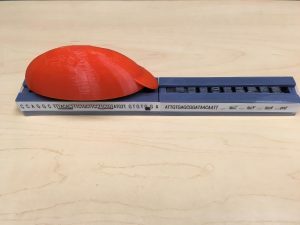 3-D printed lac operon model interacting with RNA polymerase. In Spring 2016, Ramirez began experimenting with 3-D printed models on her own in the Makerspace at D.H. Hill Library. She secured funds for the project from a small, internal STEM grant awarded by Alumni Distinguished Undergraduate Professor Bob Beichner in Fall 2016. This grant allowed her to hire undergraduate research assistant and microbiology student Tessa Lacara and continue to grow the project. Wanting to take the project further, they considered working with DELTA. “I was not convinced at first that DELTA would be interested in this project,” said Gordy. But while attending a grant group consultation session, DELTA’s Creative Director Mike Cuales encouraged them to apply. “What made me believe that it might be possible was thinking about the project in a bigger way,” said Ramirez. “It challenged us to ask, ‘what could this be?’” In Spring 2017, Gordy and Ramirez submitted a DELTA grant application, beginning work with DELTA in Fall 2017. Drew Phillips (left) and Felix Harris (right) presenting at the Gender and Equity Symposium. Gordy, Ramirez and the DELTA team are currently working with undergraduate research assistants Felix Harris and Drew Phillips, who design and print 3-D models for different scientific concepts in the D.H. Hill Library Makerspace. “I think the opportunity that it has provided for the students to help the instructors is amazing, and just to see how quickly they have picked up on things and taken it further feeds back and gives more ideas,” said Sanchez. 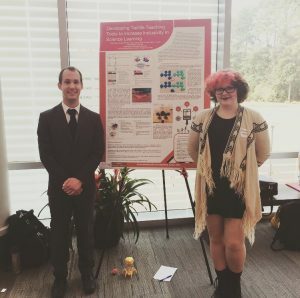 Genetics student Harris and biological sciences student Phillips both presented at the Gender and Equity Symposium on April 2, 2018. The website is still in the planning phase. “We have spent a good chunk of time assessing the different audiences that we think we are going to be addressing with the website, such as who are they, what do they want to get done and what problems have they run into with current solutions,” said Tredwell. The DELTA team currently has an organizational flowchart for the website. Development will begin in a few weeks, followed by quality assurance (QA) testing, then officially launching at the end of Summer 2018. The website will serve as a hub where makers and educators from high school to college levels can build a community around using tactile teaching tools. It will connect those interested in improving their courses with makers who know how to build 3-D models, allowing educators who lack the resources or knowledge of 3-D design to provide more for their students. “There’s not really something out there for this niche,” said Sanchez. The DELTA team plans to implement features which will allow users to share and modify 3-D printing files, lesson plans, assessments, lesson instructions, learning outcomes and teaching notes. “There are a lot of models that already exist that we can help people use better,” said Ramirez. Creating 3-D objects of processes that cannot be observed by the naked eye makes it difficult to translate them into meaningful visual models. “I think it is challenging to conceptualize what these processes might look like as a model,” said Ramirez. The models aren’t exact representations of the molecules as they exist in reality, focusing on the interactions between them. Different colors and Braille symbols are used for various parts and models. “It is less about the actual shape and structure of the molecule so much as what they do,” said Gordy. 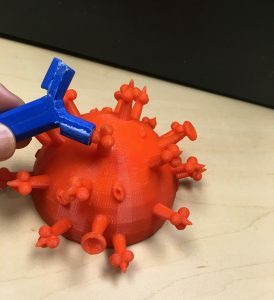 3-D printed models of a flu virus and an antibody. Making a model that is affordable and replicable poses another challenge for undergraduate research assistants Harris and Phillips. These models involve electronic, magnetic, moving and interlocking parts which complicate the design process. “Depending on the biomolecule you are printing, maybe in real life it is actually flexible like an antibody,” said Ramirez. There are flexible filaments available for printing, adding new possibilities for 3-D models. “This is a flu virus, and we talk about the different proteins on the surface and how different proteins have different binding sites,” said Ramirez. What started out as a small-scale effort with Ramirez tinkering in the Makerspace at D.H. Hill Library turned into a project with the potential to impact educational communities outside of NC State, across North Carolina and the country. “Once the website is up and running, the goal is to be able to work more on creating a larger community outside of NC State that brings together faculty interested in teaching with these tools with makers who have the skills to actually develop them,” said Gordy. Gordy and Ramirez plan to submit an application for a National Science Foundation (NSF) Grant to generate assessment data about the impact of 3-D models used in teaching biological processes.